Light on Earth - Jackson Wild: Nature. Media. Impact. The spectacular and magical light produced by glowworms, fireflies and luminous plankton is known as bioluminescence - light made by living creatures. But those quite familiar glows and flashes are just a tiny, easily observed fragment of a previously unexplored, mysterious realm. 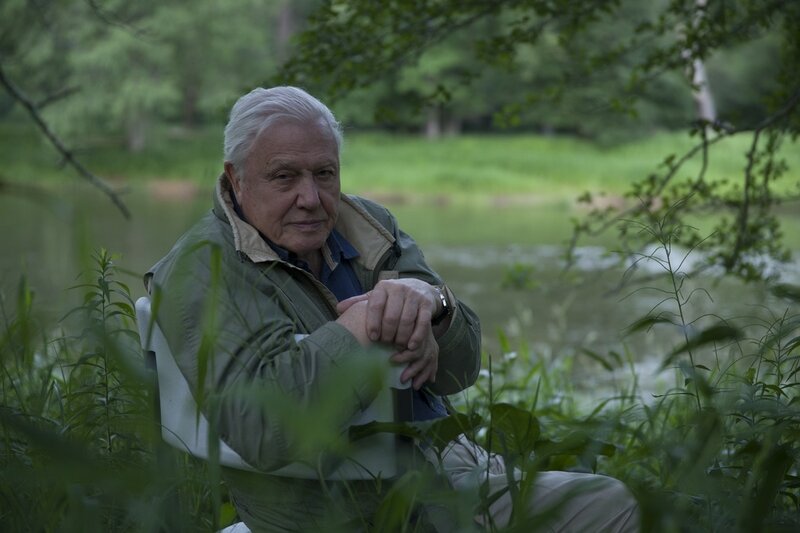 Sir David Attenborough will be our guide, as we venture into a world he describes as "utterly unlike our own". He and a team of the world’s leading scientists take us on a quest into the fascinating realm of living light. Be a responsible tourists. Do not try to touch, swim, or otherwise pollute areas where bioluminescent creatures are active. This is for their safety, not yours. They are very sensitive to changes in their environment. Use alternative transportation, and reduce your consumption of meat. Reduce pollution of the oceans. Organize an ocean cleanup day. Reduce your dependency on single use plastics and other “trash” and recycle as much as you can - most waste streams end in the ocean! At Ammonite, we have been working in darkness for decades on many different subjects. If you find yourself in a place with absolutely no visible light for any length of time, bioluminescence of one sort or another is often visible. Every now and again, you will see something utterly extraordinary and truly beautiful. As a film maker, that is inspiration to bring that sight to bring to a wider audience. The biggest challenge is how to create a competing narrative out of such a large and sprawling subject as Bioluminescence. 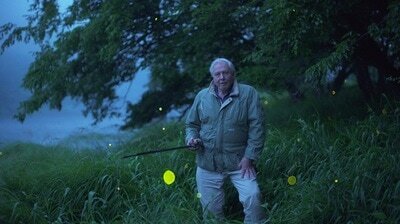 The trick was trying to find a way to make it a film about bioluminescence and not merely a disjointed collection of short pretty scenes about animals that use bioluminescence. Of course simply visualising not only the faintest ephemeral glow but also the animal producing that light in a completely dark environment it is doing is a huge and unique challenge. Telling the story of the science of bioluminescence was a particular challenge, as so much is basically unknown. We worked hard with the language of the scientific explanations to make them understandable to all, but without patronising the audience. This is one of the reasons why David Attenborough was a perfect choice to present the show. We hope that people watching this film will come away with a sense that there is still so much to uncover and understand about the natural world. 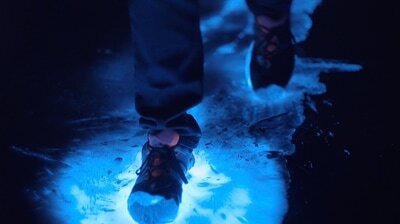 Most people are barely aware of the existence of bioluminescence, and few are aware of how common it is, and how little we know about it. Hopefully this show will persuade people to venture in to the dark, into the wild, to discover this incredible phenomenon for themselves. With something so universal as bioluminescence, yet something that is also relatively poorly known, almost every sequence we tackled was a journey of discovery. The earthworms are one of the most fantastic sights, not just because of their recent re-discovery, but also because their light making seems impossible to understand. The study of bioluminescence needs more funding and open minded science, not just because it is so little known, but because it is so universal in nature. The frequency of bioluminescence in the natural world suggests it is more than a pretty scientific curiosity, and instead is somehow more fundamental to life. 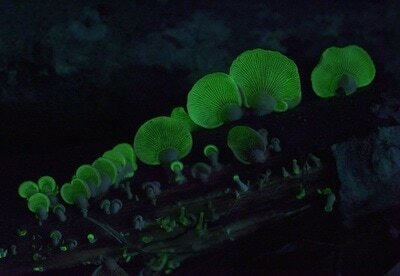 There are plenty more amazing bioluminescent stories for films, and we are developing ideas. But funding for films about bioluminescence is, as we have discovered, very hard to find. In the mean time, we are making a film about ants. In order to make the images for Light on Earth, we had to dig deep into our 2 decades of working in the dark with infra red and intensified cameras. New cameras on the scene enabled us to do the same in 4k. But with almost all the imagery, we also had to develop our noise reduction techniques that went way further than we had ever achieved before.